Ski in / ski out to within metres of our self-catered apartment. 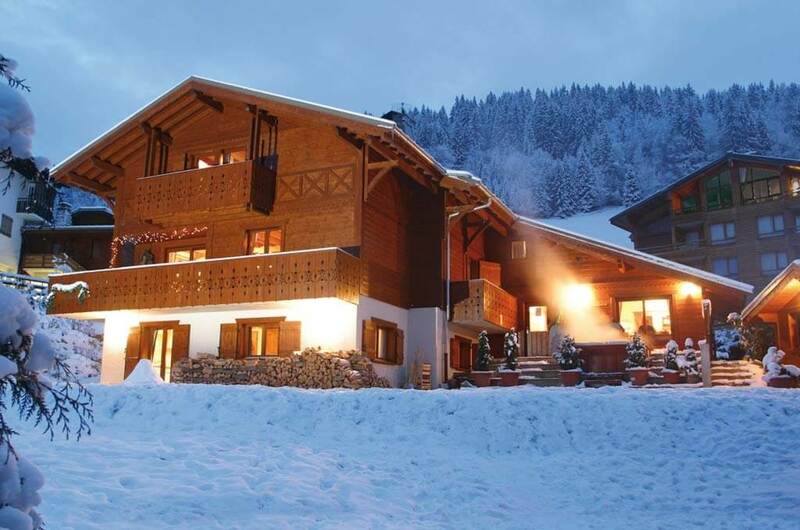 Located on the ground floor of Simply Morzine’s flagship Chalet des Montagnes and a short 10 minute walk to the centre of Morzine and main ski lifts. The apartment benefits from marvellous views and a stunning outdoor luxury hot tub (shared with main chalet guests), 2 ensuite bedrooms and a single sofa bed. Sleeps 2-5. Set below one of Morzine’s ‘home run’ pistes that return to the Pleney cable car, our popular 2 bedroom self-catered apartment is almost ski in / ski out, snow conditions and skiers ability level permitting. 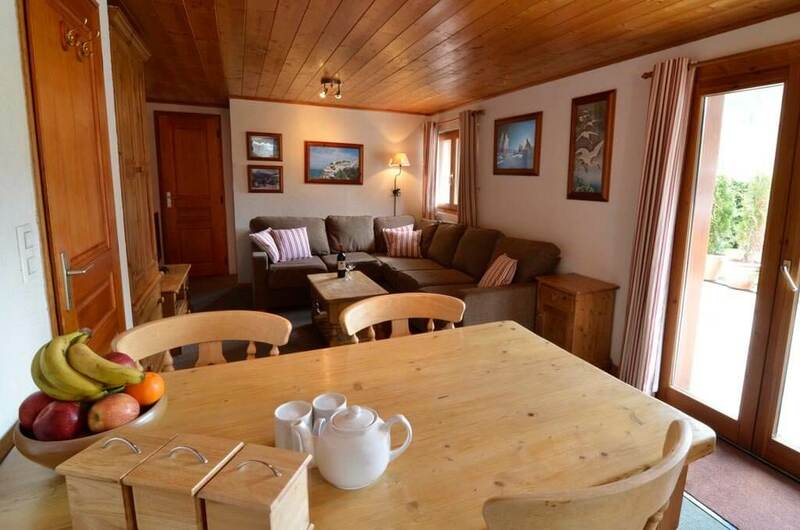 Located on the ground floor of our flagship Chalet des Montagnes, the apartment is self-contained and private. It is ideal for a small group or single family and will accommodate four people comfortably (five people using sofa bed in the lounge). 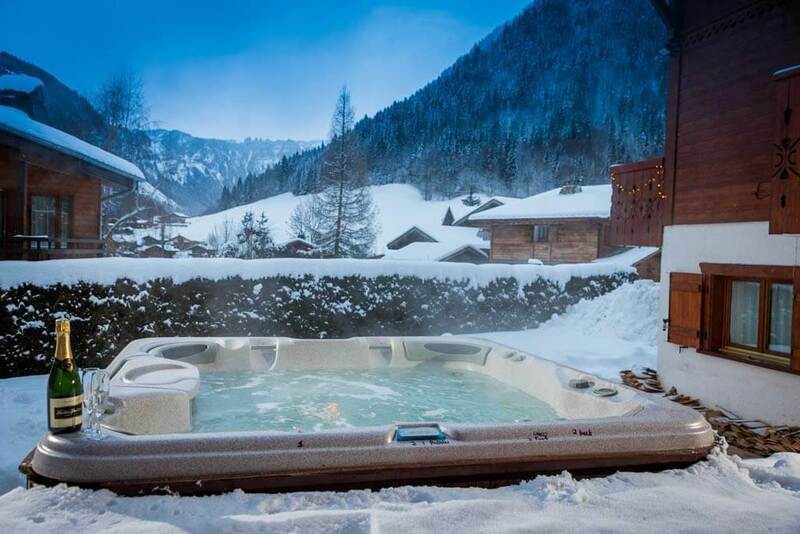 Guests staying in the apartment benefit from use of the chalet’s magnificent outdoor hot tub (at a designated time due to being a shared facility with the main chalet guests). 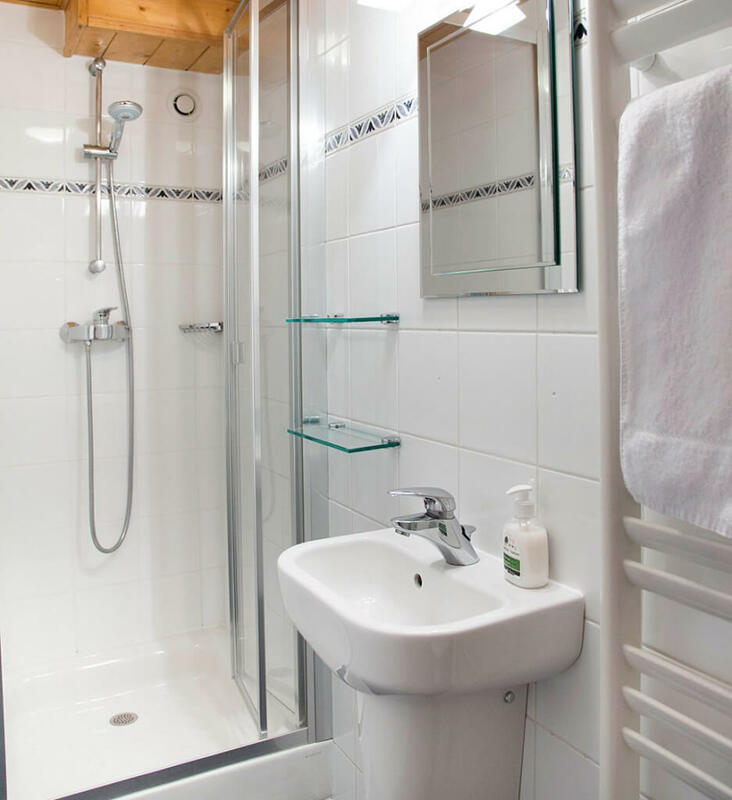 In addition to easy ski access, Apartment Montagnes is very well situated for all of Morzine’s amenities. The main ski lifts, and centre of Morzine, with a wide range of shops, bars and restaurants, are only a 10 minute walk from the apartment. The bus stop for Les Prodains (fast, free access to Avoriaz and the wider Portes du Soleil ski area) is 3 minutes by foot. Alternatively, take the ‘Petit Train’ from the Pleney to the Super Morzine lift and on to Avoriaz. Despite such close proximity to the centre of Morzine, the apartment is located in a peaceful and upmarket residential area, with glorious panoramic views towards Avoriaz. 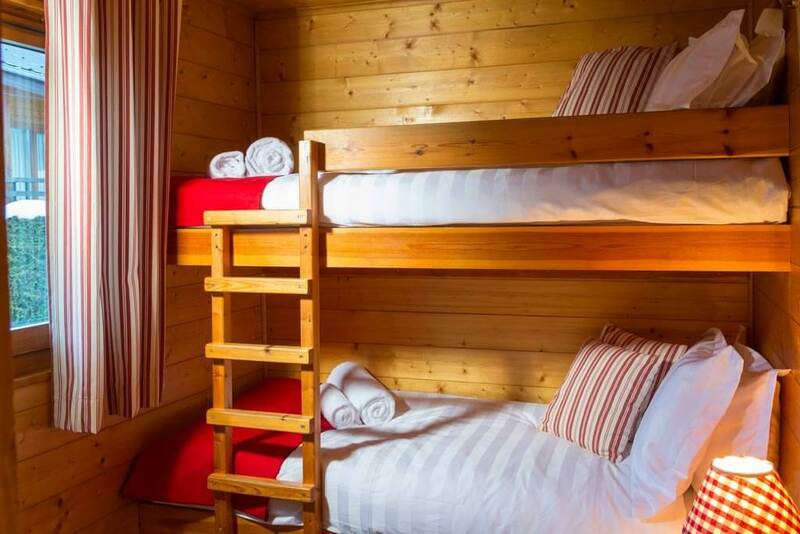 The self-catered apartment at Chalet des Montagnes is practical, delightfully furnished and well equipped with everything needed for the perfect self-catered ski or snowboard holiday in Morzine. The cosy and immaculate interior consists of a well-proportioned open plan lounge, dining room and kitchenette. There is a comfy seating area with L-shape sofa bed, TV (UK Freesat), DVD player and wireless music system. The kitchen area is fully equipped with dishwasher, oven, microwave and fridge-freezer. The apartment offers two comfortable, wooden-clad bedrooms. Bedroom one has a double bed and the second, smaller, bedroom two has a bunk bed. There are 2 bathrooms, each with shower. Bedroom one is ensuite, the 2nd bathroom is off the lounge and adjacent to bedroom two. 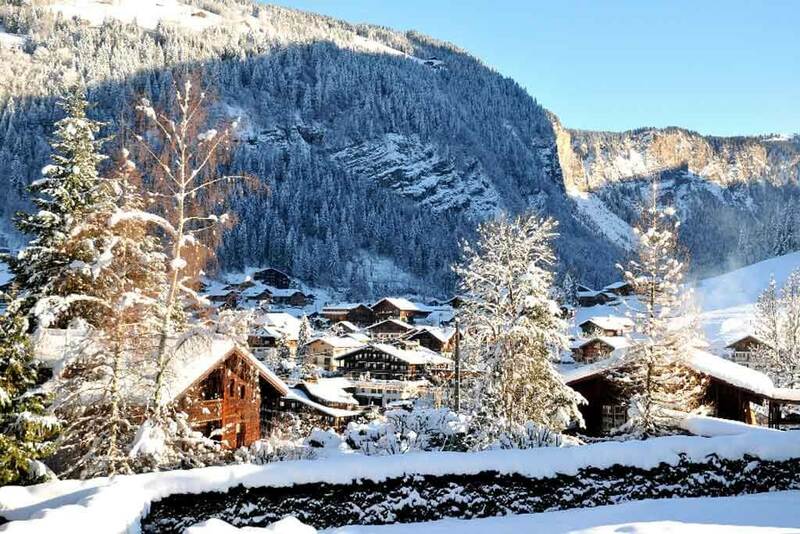 There is a chalet ski store with heated boot warmers and private parking for those who drive to Morzine, although we can provide return Geneva airport transfers if required. 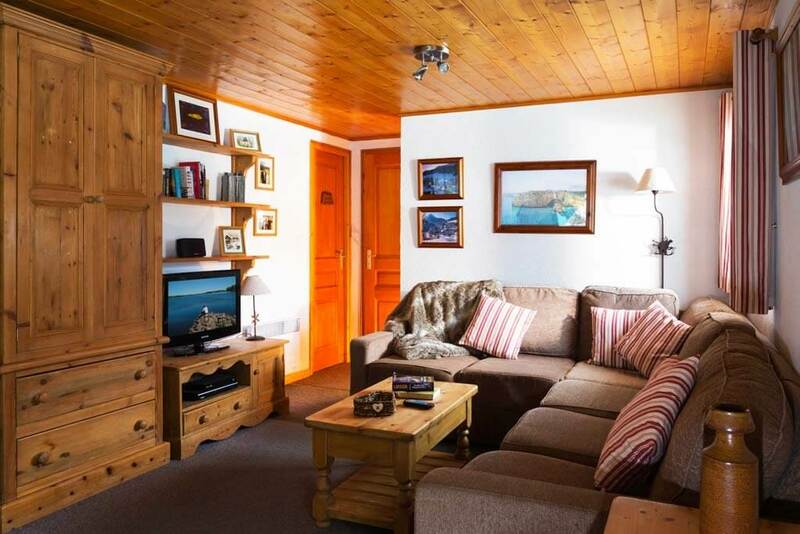 The apartment can be booked as part of the main catered chalet accommodation to increase the capacity for a larger group, giving a total of ten bedrooms and ten bathrooms. 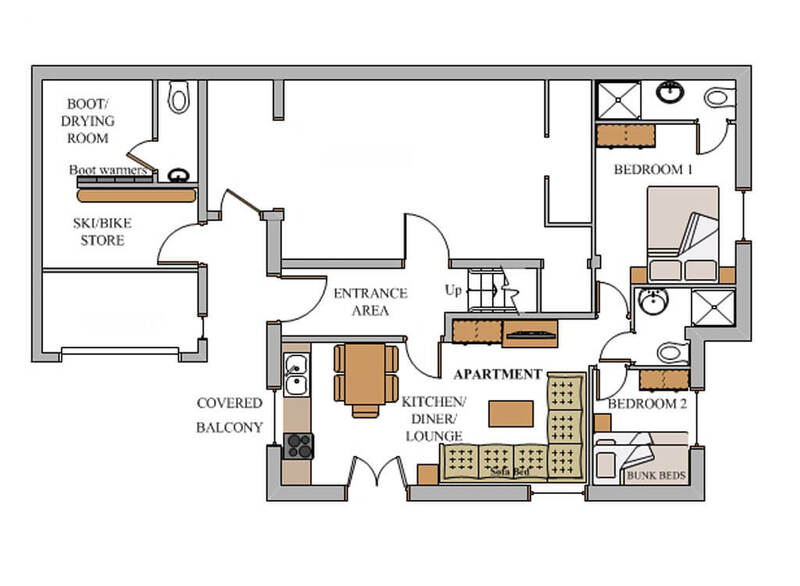 The apartment can also be booked on a private catered basis. Breakfast and 4-course evening meals (with wine/beer) will be cooked in the main chalet kitchen and served to you in the apartment. 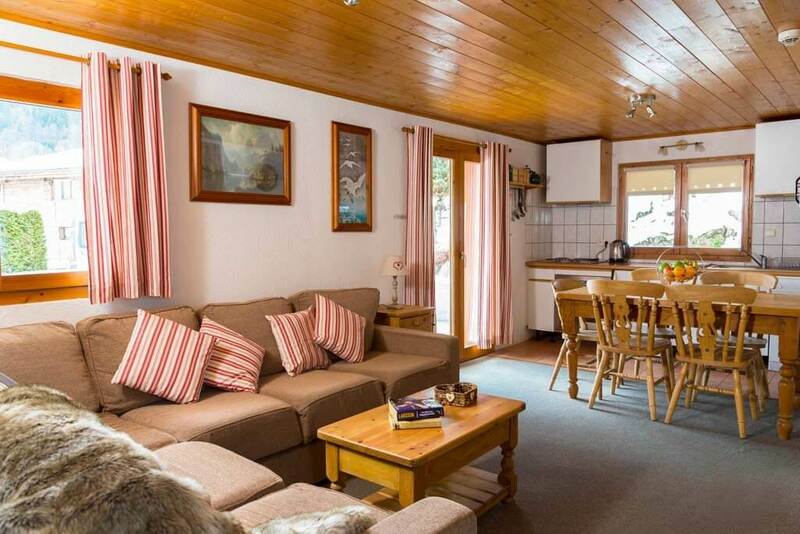 The apartment can be let separately from the main catered chalet on a self-catered basis. Comments: Double bedroom is ensuite. Bunk bedroom has a separate bathroom off the lounge. 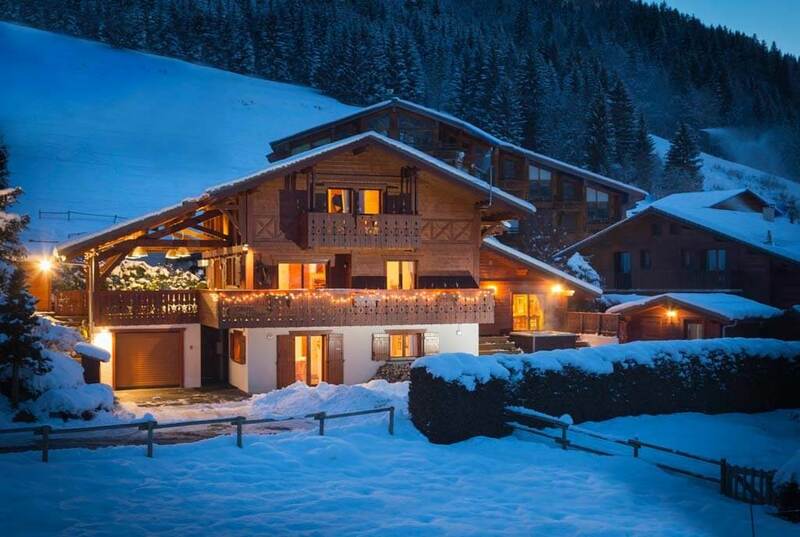 The location is one of the most sought-after in Morzine; a peaceful and upmarket residential area with magnificent panoramic views, yet just 50 metres from the piste, a 5 minute walk from the nearest lift and our local ski shop, and a 10 minute walk to the town centre. We also provide a pre and post-skiing minibus shuttle service for your convenience, should you not wish (or not be able) to walk or ski from/to the chalet. Prices shown are for self-catered bookings. Please contact us If you would like to book: the apartment on a catered basis or the main chalet & apartment together on a catered basis. Please refer to Chalet des Montagnes for all information regarding what our catered winter holidays do and do not include.